Happy Tuesday everyone!! 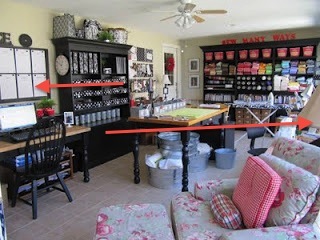 I wanted to share another tip that I've used while making some changes to my sewing room. I wanted more wall space, so I moved a hutch around to clear out a center wall area near my cutting table. Usually, when I hang things on the wall it's over a piece of furniture...over my desk or cutting table. However, I'm a shorty (5' 3"...ok maybe 5' 2 3/4" lol) and it's easier for me to walk up to something on the wall rather than reach over a table for it. I moved the top of the hutch to the top of my desk for lots of office storage since my desk is just a butcher block table with no drawers. Then I moved the bottom of the hutch to the other side of the room where the windows are. It fits just below the windows, so it's perfect. Here's the after!!. I still have a few things to add, but I'm not finished with the projects yet, so I'll share those later!. Other miscellaneous things tucked in spaces to hold knick knacks and more to come!! Are you nervous about hanging multiple pictures in a collage form?...well, here's the Tool Time tip...brown craft paper. It's cheap and easily found in any store. Just trace each picture frame and cut it out. All you need to do is use painters tape to hang the "paper frame" and move it around to where ever you'd like. Don't forget to mark the hangers that on the back of the frame to the paper frame, that way you know where to hammer in the nails...eliminating all the guess work. Reality check!! Why do tables pile up with so much stuff? Get out your brown craft paper ladies. Hanging pictures is going to be a lot easier now!! Another great tip Karen. Thank you! 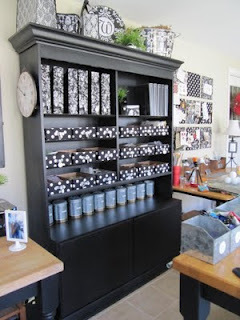 I think this would be a great way to plan where to hang some of my small quilts too. I trace them on paper grocery bags. Sometimes I have to tape a few together but it works for me! 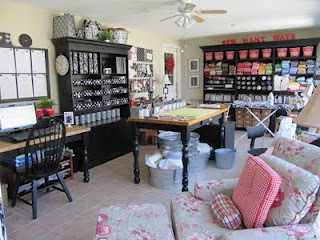 Your sewing room is one of the best in blogland! I love that your beautiful hutch can be split up to suit your needs! That's genius! And I will definitely be using that paper tip for hanging stuff! I love that! You have such an incredible craft room! Hope you're having a great week!